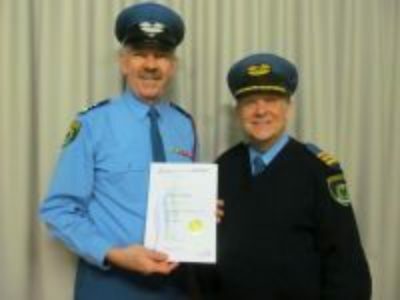 Wing Captain Martin Ball has become the first Air League officer to receive a Certificate in Active Volunteering from the School of Volunteer Management in Sydney. Martin, the new OC South Australia Wing and a former senior RAAF officer recently achieved the CAV1 certificate after completing a short program of study and 30 hours of active volunteering in the Air League. The CAV course is a nationally recognised qualification and Federal Training Commissioner Tom Short said; “It means our young leaders can now gain external recognition for their voluntary work in the Air League and this is something an employer would value’. More information on the Certificate in Active Volunteering can be obtained from Group Executive and Training Commissioners.